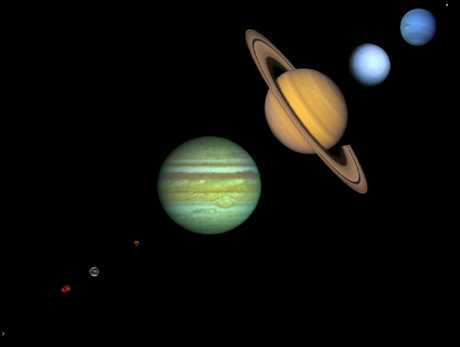 The Nine Planets is a collection of information about our Solar System intended for a general audience with little technical background. No special expertise or knowledge is needed; all technical and astronomical terms and proper names are defined in the glossary. The bulk of this material should be familiar to planetary scientists and astronomers but they may find a few interesting tidbits, too. a list of open issues for which we as yet have no answers. links to "movies" of a few objects. There are also a few miscellaneous pages: on planetary science spacecraft, the glossary, a comprehensive list of planetary images available elsewhere on the Net, some bits of history, several pages of data and a special plea for your support of the space program. At the bottom of each page is a set of links to other related pages. To visit the next body in an ordered traversal of the solar system choose the link immediately to the right of the name of the current page. You can also go back to the previous page, the "parent" page, the table of contents or to the detailed data page. I've chosen ten of the most interesting bodies and linked them into an Express Tour. If you don't have time for the full tour, don't miss these. And if you want to read offline or just explore in more depth, visit The Nine Planets Bookstore. Many of the images here will look much better if your system uses at least 16 bits per pixel. If you're having trouble viewing something, see the Technical Help appendix for some hints. It will also go faster (for you and everyone else) if you use the mirror site closest to you. Most of the inline pictures here come from these sources, especially the first two. Without their efforts and the efforts of all the scientists and engineers at NASA and JPL this tour would not be possible. The full tour continues with the Overview (or if you're in a hurry take the Express Tour). The names at the bottom of each page provide access to the next world in the full tour and a few other related pages; the icons provide access to the table of contents, the page of detailed data and this site's "home page". If you haven't already, please switch to the mirror site closest to you.